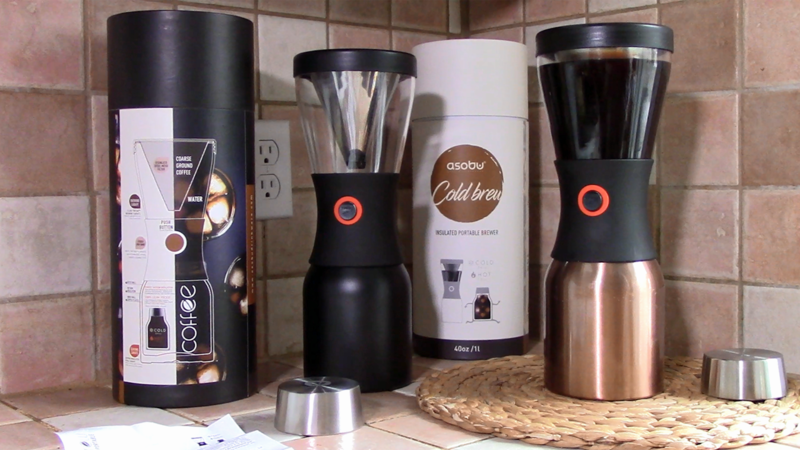 Our review of the Asobu Cold Brew Insulated Portable Brewer. Many thanks to the folks at Asobu for sending us not just one, but two of their cold brew, insulated portable brewers. Before we get into talking about how the brewer works… let me touch on a couple of other points. First, why cold brew coffee? Because it has a smoother taste and is significantly less acidic than coffee brewed with hot water. Brewing with cold water takes a lot longer – 12 to 18 hours – but the result is a brew that is great for all manner of cold coffee drink recipes. And your cold brew can be heated up as a regular coffee for people who are sensitive to the acid in hot-brewed coffee. Second, a word about the design of this brewer. I have a few cold brew coffee makers on shelves in my basement. They all do the job, but some are just downright ugly. This Asobu brewer is, to my mind, a beautiful piece of design. That means I’ll be happy to have it on my kitchen counter. Instead of adding to the “appliance clutter”, it will add to the aesthetic of the space. Nice design! OK… now onto how it works. In common with other cold-brew systems, it’s super simple. No power supply, no pumps or moving parts. Just gravity. You add medium-ground coffee to the steel filter basket and place it in the upper chamber. Then slowly pour cold or room-temperature water over the coffee until the chamber is pretty much full. Now leave it to stand for 12 to 18 hours. Try the coffee at both ends of that time period and you’ll figure out how long you want to it sit for the brew that’s right for you. When you’re ready, hold down the button between the upper and lower chambers until the upper chamber is empty. That bottom chamber is a dual-walled insulated flask, with a screw-down lid. Take it anywhere… to your desk, out in the garden, on the beach… wherever. 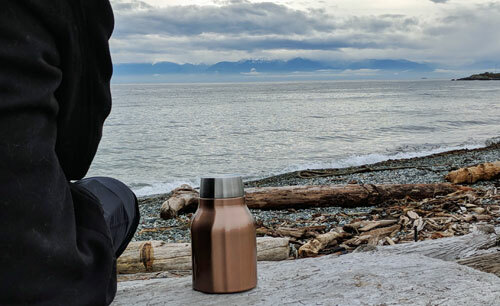 On the beach with the thermal flask from my Asobu Cold Brew Insulated Portable Brewer. According to Asobu, the flask will keep your cold brew coffee chilled for up to 24 hours, and hot coffee hot for up to 12 hours. Like I said at the outset, this is a beautiful piece of design. But it’s also wonderfully functional. And it has been made with the understanding that people may want to take their cold-brew with them. I have some ugly cold brew brewers and a couple that look just fine. But only the Asobu hits the spot with both its design, ease of use and portability. So yes, I really like it. Two of the four color choices you have when getting the Asobu Cold Brew Insulated Portable Brewer.